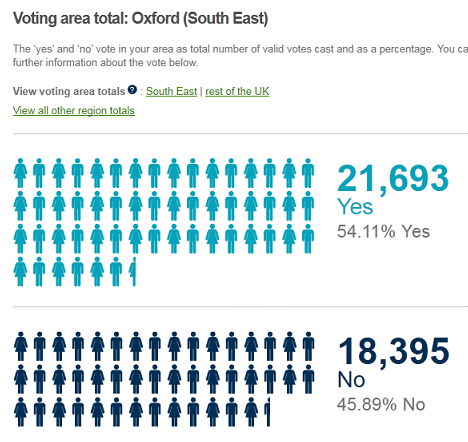 The Electoral Commission has published the voting breakdown area by area for Thursday’s ‘alternative vote’ referendum. Just 10 of the 440 areas voted in favour of ditching our current voting system. If I’d had to predict the place in the UK that would prove to be the most pro-fair votes, I have to confess I would not have guessed Hackney; at least it shows a majority of voters there don’t listen to their local MP, ‘No’ doyenne Dianne Abbot, which I find reassuring. Less of a surprise that Oxford, Cambridge, Edinburgh and Glasgow — all historic university cities — should have been among the few that said yes to AV. Of course, if the UK was genuinely a liberal, decentralised country, then these 10 areas should now feel free to elect their MPs under AV. Why not? 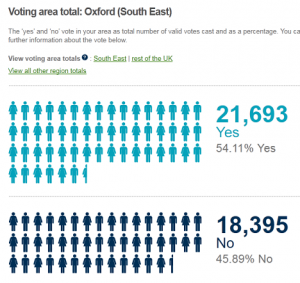 1) The ‘Yes to Fairer Votes’ campaign clearly failed. Tom Clark has posted 10 reasons he thinks Yes lost over at The Guardian, and by and large I think there’s something in all of them (and, in particular, the bizarre Electoral Commission leaflet which made the ‘alternative vote’ appear the most freakishly complex voting system yet invented). I would add another: the focus of the Yes campaign on the MPs’ expenses scandal misjudged the moment; it was so two years ago, and has been superceded by the focus on Coalition politics. 2) However, there was clearly appetite for the public to have their say. The lowest turnout in the entire country was in Newham, and even there it was 27%; it topped 50% in 65 voting areas. The media and No to AVers constantly cynicised that the campaign had failed to engage the public, and no-one cared. That so many voted, almost 20 million, suggests otherwise.